Glary Utilities for Windows 7 - a multifunctional set consisting of many small utilities. With it, you can make a comprehensive optimization of the operating system, perform individual work with files and analyze the selected data. Special function Disk Cleanup, gets rid of all the accumulated garbage file. The application is able to synchronize with the standard tools of Windows, allowing you to use them with software features. The path tracking plug-in is able to remove all traces of “travel” on the Internet, including cookie files. 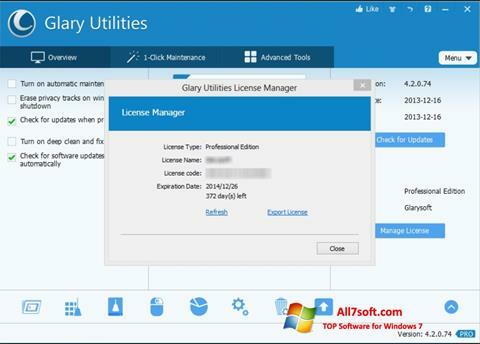 You can free download Glary Utilities official latest version for Windows 7 in English.